AFL 2015 – are you ready? So you’ve decided to follow the Australian Football League from America, but you’re not sure how to get started? We have added an experienced AFL writer who actually lives in the land down under to guide us through this fast-paced interactive sport. But can you get through that painful first water-cooler conversation without outing yourself as a noob? Yes: all you have to do is pick a team to follow, follow us and our continuing writings on this great sport, and you’re all set for a great winter – or summer? – of football. Eighteen teams, eight spots in the finals, one prize. Are you ready for the opening bounce? Here are a few tidbits you may want to familiarize yourself with the season begins. Much pre-season press has been occupied with the Essendon supplements scandal, which is staggering given that a whole season has gone by since the story first broke. The Readers’ Digest version is that some Bombers players (how many? if records were kept, we’d know) were semi-systematically injected with peptide Thymosin beta-4 during the 2012 season, for some putative athletic benefit. Whether the benefit was ever enjoyed is unknown, but the club has doubtlessly not enjoyed the consequences: sackings of officials, fines, loss of draft picks, and the fact that using needles willy-nilly around athletes leaves a filthy taste in the mouth of even the worldliest sports fans. Golden-haired ex-captain and premiership hero James Hird, currently the club’s coach, has become a polarising character. Whilst investigations are still in progress, public opinion is divided into three corners: the “let’s wait and see what the verdict is” crowd, and two groups who are diametrically opposed on the point of whether Hird is a white-feathered angel, or one of those scary angels with flames and other spooky stuff coming off it. After their interrupted pre-season, the club needs a fast start to change the headlines – if they do poorly, they’ll have a lot of haters; if they do well, it may be painted as vindication. Regardless, the Bombers will be hearing about this and regretting 2013’s club slogan “Whatever it takes”, for a few seasons to come. 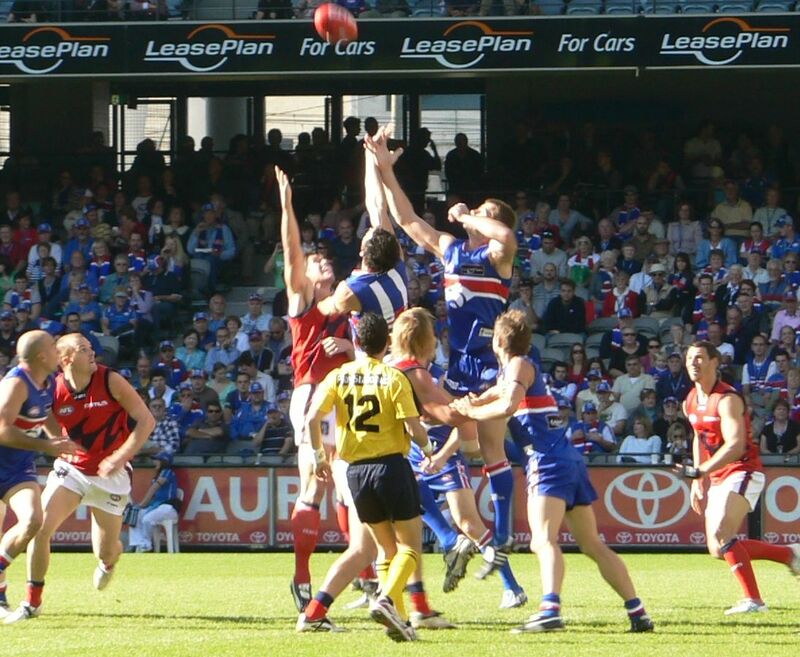 The AFL season consists of 18 teams each playing 22 games – every team once, and 5 teams twice. Arguably, this is not so much of a problem – the NFL solved it years ago with the weighted rotating schedule. The AFL has solved it by ignoring it, continuing to use as the foundations of its schedule a small roster of matches likely to draw a large crowd, local rivalries in New South Wales, Queensland, South and Western Australia and the balancing of requests by the clubs themselves. In a sport which makes a fetish of intensity and the importance of every contest, it’s strange that this doesn’t get more air play than it does. The league actually keeps a statistic called “one percenters” – defensive interventions and off-the-ball efforts which would otherwise go unnoticed – with the clear implication that every small contribution counts. Strength of schedule makes a far bigger difference to match outcomes than one percent (just ask any betting agency), but this gets hidden behind “if you’re good enough, you’ll win against any team” and plenty of other usefully manful platitiudes. Effectively, it means either believing the fiction that a game against the Hawks (53-13 in the last 3 regular seasons) is as difficult to win as one against the Giants (9-57) or accepting the competition set up and institutionally unfair. When you’re the best player in the league, you’ve won two premierships in four years and you’ve just finished your ninth season, what’s the next obvious move? If you said, sign a five-year deal with an expansion club 1000km away, in a state where football isn’t even the primary sport, you’re either very clever or you Googled “Gary Ablett 2011 transfer to Gold Coast”. The fifth season of that deal starts now. Expectations remain high for Ablett, who has appeared in more games than 99% of players in the history of the league, but will be just 31 years old in May. Perhaps after the premierships and two Brownlow Medals (MVP of the league), all that is left for him to achieve is to lift the Gold Coast Suns to heights never experienced in their short history: the top 8, and finals football in 2015. The club is better placed to get there than at the beginning of any previous season, whilst Ablett himself is actually worse for wear – a shoulder injury forced him out of the last six games of 2014, heading off a third charge at the Brownlow. But the fun in watching Ablett is that he is always good, combining above-average skills and athletic ability with an uncanny knack for making the right decision with the ball – Peyton Manning, but with an exceptionally shiny head. The countdown to round 1 has been a little muted, with most of the nation distracted by the Cricket World Cup – the final of which, at the Melbourne Cricket Ground, is the cause for the April start, a fortnight later than usual. Yes, the unavailability of just one stadium is enough to keep the entire AFL waiting: it seats 100,000, and officials expect to get it near-full at least twice in the first weekend, and again in week two. The stadium-sharing arrangement, in short: the MCG is the home ground for Melbourne, as well as teams originally based in the inner suburbs of Richmond, Carlton, Hawthorn, Essendon, Collingwood and occasionally from Melbourne’s nearest satellite city, Geelong. When not expecting a huge crowd, all of those clubs will either give up that potential seating capacity for the indoor comfort of the Docklands stadium, half the size and just a few kilometres away, or except a wadful of cash to play the game in Hobart, Canberra, Darwin, Wellington (New Zealand) or just about anywhere else. So, Docklands is nominally the home of the other Melbourne-based teams: St Kilda, North Melbourne, and the Western Bulldogs. In reality, anyone can face anyone at either venue, and claim to be the home team. In part, all of this is dictated by the financial arrangements clubs are compelled to make with venues that they are effectively leasing each team they play. Geelong, meanwhile, has the smallest venue in the league, despite the fact that it perches like a recently-landed spaceship on the fringes of the city; but more importantly they own it – so, even a crowd of 20,000 for a game against a poorly-supported team from interstate could be a lucrative day of football for the Cats. All of it serves to make the rich richer and the poor, if not poorer, stationary on the AFL treadmill. Last year, Hawthorn rolled to victory on the last day of the season, having spent most of it boredly crushing its opposition. In 2015, with Brad Sewell the only significant loss to its playing list, can anyone stop them? 2014’s top four provides the usual suspects: Sydney and Geelong, along with the slightly nouveau-strong Fremantle – will challenge; no club other than these has gone all the way after finishing the previous season outside the top four, since Brisbane stunned everyone in 2001. 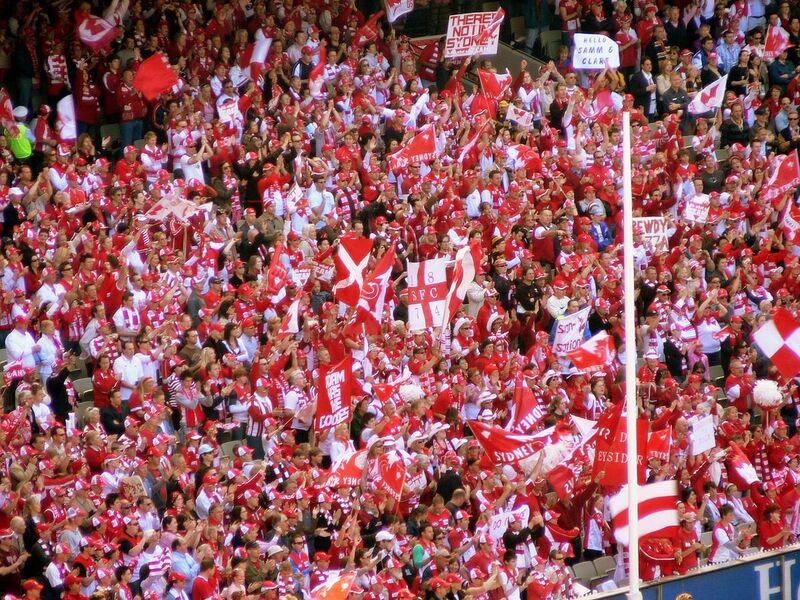 It’s hardly a prediction to say that the lower half of the league figures to be cannon fodder when faced with the powerhouses; the real question is whether smaller clubs St Kilda, North Melbourne, the Western Bulldogs, and the expansion Giants can be competitive enough to engage their fan base (or in the case of the Giants, find one), make financial gains and fund the un-salary-capped off-the-field programs which will help them bridge the gap. It will be a shock if at least one average club doesn’t force its way into top four contention; enjoy watching the fairy tale develop, and make sure that when it ends you haven’t shifted your money away from the juggernauts.